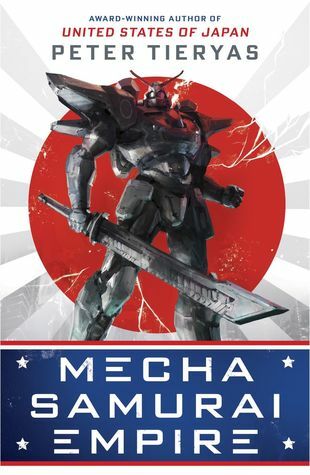 Mecha Samurai Empire takes place in the world of Peter Tieryas’ United States of Japan, an alternate history described as a spiritual successor to The Man in High Castle in which the Japanese won World War II and conquered America. While this is the second novel set in the USJ sequence, the author’s intention is for each book in the series to be a standalone focusing on a different aspect of this universe, and in the case of this one, our story follows a young man on his journey to become a mecha pilot so he can join the war against the Nazis. The books starts off in the year 1994, and our protagonist Makoto “Mac” Fujimoto is a Californian teenager who has spent his whole life growing up under the imperial rule of Japan. With dreams of one day fighting for his country by joining the mecha corps, he must ace his upcoming Imperial Exams because the program will only accept the best of the best. The only problem is, Mac is a terrible student. Even with his powerful resolve and the fine skills he shows in the war sims he plays at the arcade and on his portical, his grades simply won’t be good enough to get him into one of the most prestigious mecha piloting schools in the world at Berkeley Military Academy. So when his best friend offers him a way to game the exams, it takes Mac great difficulty not to simply give in to the temptation of doing something immoral to get ahead. Ultimately though, his refusal to cheat winds up saving his life, even as his dreams of attending Berkeley after graduation lies in tatters. Still, there may yet be a way for Mac to become a mecha pilot—as a civilian—but only if he manages to survive long enough in the dangerous political climate created by escalating tensions between Germany and Japan. After reading United States of Japan and now Mecha Samurai Empire, I’ve started to notice that Peter Tieryas has a remarkable l knack for writing about underdog characters and getting the reader to cheer for them. Mac is a great example of an underachiever, particularly in the academics, who can still work his way to his goal with strong determination and a good heart. Perhaps apropos to this series, his journey also shows that while a disaster can alter the course of your entire life, new opportunities can arise from plans that go awry—opportunities that you may have never even considered before. As a result, Mecha Samurai Empire is also a first-rate coming-of-age tale as Mac struggles to find his identity and carve out a role for himself while navigating this world of colonialism, conspiracy, and corruption. He discovers that reality isn’t as black and white as he’s been led to believe. He experiences what it’s like to be in a real battle and in real danger—so very different from the simulation games he plays. He learns about love and loss, forging new relationships while also realizing how much his old friends mean to him. But now let’s turn to the main reason why you’re probably checking out this book: the totally badass giant robot on the cover. Yes, this story has mechas. A lot of them. In fact, if you were somewhat disappointed by the relative lack of mecha action in United States of Japan, I think you’ll be quite happy with how much of it you get here. Inspired by anime and games like Persona, Zone of the Enders, and Metal Gear, Tieryas packs this novel with plenty of thrilling and fast-paced battle scenes as well as references to gaming and geek culture, making it perfect for fans of sci-fi action and adventure. In addition, the author has greatly expanded his world-building in this volume, giving us a look at another one of the many interesting sides to the USJ universe. A significant portion of it explores the cold war between the Japanese Empire and Nazi Germany, the latter of which has continued to commit the worst kinds of atrocities. Meanwhile, the government in the Unites States is also dealing with a group of rebels known as the George Washingtons, whose goal is to break the country free from the rule of Japan. Because of the modern setting, at times it’s easy to forget this is an alternate world, but inevitably something always happens to pull you back into this strange and unfamiliar place and remind you that the different outcome of WWII has affected all aspects of culture and society on a global scale. That’s also why I was tremendously excited to read Mecha Samurai Empire, because I wanted to know more and explore this alternate timeline further after reading United States of Japan. While the two books may share a few thematic similarities due to the fact they both take place in the same world, on the whole they are still vastly different. Furthermore, Peter Tieryas has clearly been honing his craft, for I feel that the storytelling and pacing is better in this book and more polished. All in all, this was a great read and I hope this is just the beginning of more books set in the world of USJ. Looks like a series I’d be interested in. Very good review! So, is the main character in any way like the main character from USJ? To me, that was one of things that didn’t work for USJ. I am heartened to hear about lots of mecha though. ‘Cause those covers!!! And hurray for a mention of ZoE! I actually liked the prequel movie better than the series because the humor in the series didn’t quite mesh for me. They were very different, at least to me. As I recall, the protag in USJ was older, tired, and jaded while MSE is a coming-of-age story. I liked Mak, and didn’t think he was too whiny or anything, which is my usual issue with main characters in these kinds of books. Glad to hear this one was good. I wanted to pick up United States of Japan when it came out but heard mixed things. Since these can kind of stand on their own I may have to pick this one up. I do love some mecha…lol. USJ was good, but I thought MSE was better so it’s not a bad idea to start with it! The writing and storytelling felt much more polished too, which might be due to the change in publisher, and also the author has improved with experience. I’m looking forward to starting this, I’m happy to see your 4 star rating! I missed the first book but I remember when it came out, I loved the idea. This was fun! I hope you’ll like it! That’s interesting there. it looks different. I actually quite liked USJ and so have been looking at this one and trying to see if I could fit it in. Basically I want it but I seem to be behind at the moment so feel like I should behave.